The White Tower in central Thessaloniki was ready for the party. The flag and scarf sellers and the kebab makers had set up shop from the afternoon on Sunday. The TV crews were picking their best angles from the spot where the PAOK following would converge to celebrate the club’s first league trophy in 34 years. Similarly, hundreds of fans of the Thessaloniki giant were about to gather at Tempe, the narrow passage that separates Thessaly from Macedonia, to greet the new champions after their victory at Larissa on Sunday evening. Except that PAOK did not win after all. The fan gathering dissolved in disappointment, the flags and the scarves were tucked away quietly and the champagne remained on ice for now, just for one more week, until PAOK clinches mathematically the Super League crown, as Larissa snatched a 1-1 draw from the league leader and postponed celebrations, although some PAOK fans did stay at Tempe to greet the champions-to-be. 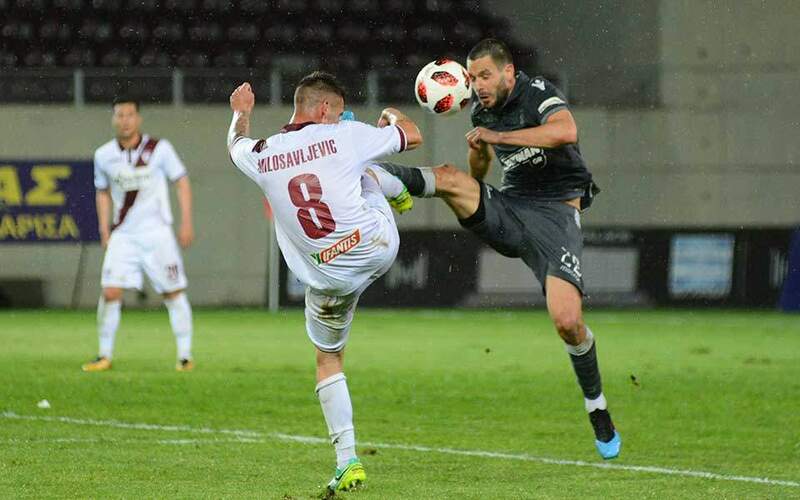 Dimitris Pelkas gave PAOK the lead at the AEL FC Arena early in the second half, but the hosts – needing points to avoid the drop – equalized with Nikola Jakimovski and postponed the crowning of PAOK to the penultimate round of Super League games next Sunday. Then PAOK will need just one point when it faces Levadiakos, that got mathematically relegated this Sunday with its 2-1 home loss to Panionios. It is following bottom team Apollon Smyrnis, that lost 1-0 at home to Panetolikos on Sunday. Olympiakos has therefore slashed the distance from the top to eight points, having also got a game in hand, after thrashing visiting Xanthi 4-0. Guilherme scored twice, and Omar Elabdellaoui with Costas Fortounis once each. AEK drew 2-2 at Lamia, as it led with Petros Mantalos, Jeronimo Barrales scored a brace for the hosts before Lucas Boye earned a point for the Athens team that lies third. Atromitos confirmed it will not finish below fourth, beating fifth Aris 2-0 at Thessaloniki, while sixth Panathinaikos had Federico Macheda score on both ends, before conceding two more goals to Ismail Sassi and Giorgos Giakoumakis and lose 3-1 at home to OFI Crete. That result has moved the Iraklio team out of the relegation zone, where PAS Giannina has now dropped after conceding a goalless draw at home to Asteras Tripolis. The bottom three teams are relegated to the new division that will be formed, the “Super League 2”, while the team to finish fourth from bottom will contest a home-and-away play-off with the team to finish second in the Football League. NPS Volos has already clinched promotion to the top flight from the Football League.